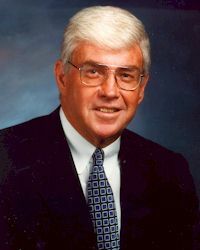 A quarterback who played 13 years of professional football, Jack Kemp entered politics in the 1960s, volunteering for Barry Goldwater's unsucessful presidential campaign. In 1970 he ran for and was elected to the US House, where he served until 1989. He was a staunch believer in supply-side economics, free markets, and low taxes. In 1988 he made an attempt to become the Republican nominee for President, but a disappointing 4th-place finish on Super Tuesday put an end to any such possibility. The winner of that election, George H.W. Bush, appointed Kemp Secretary of Housing and Urban Development. Lackluster support from the Republican administration and tiny budget appropriations rendered his stay at HUD largely impotent, even as the 1992 Los Angeles riots put national focus on housing and other social issues. Despite a long marriage and four children, Kemp was dogged with whispers of alleged homosexuality, which — as a conservative Republican, outspoken in his opposition to gay rights — undoubtedly would have derailed his career. In 1986 he was asked on The Today Show to "categorically deny" being gay, and did so immediately. In 1989 the FBI made Kemp's sexuality a key factor in a background check when Kemp was under consideration for the HUD post, and the Bureau's official report stated that "these allegations were well investigated and found to be without basis in fact or truth". In 1996, nominee Bob Dole chose Kemp to be his running mate. Far more progressive than Dole, it was thought that Kemp's views on taxation and social issues would balance Dole's desire for a balanced budget and more conservative social policy. The ticket might have had a better chance if Kemp and Dole's positions were reversed. Bill Clinton and Al Gore won the election handily, carrying 379 electoral votes to Dole/Kemp's 159. Had H. Ross Perot not run, it would have changed the numbers somewhat, but not the outcome. After retirement from office, Kemp served on a number of corporate boards and remained somewhat active in Republican politics. He founded and was Chairman of Kemp Partners, a consulting firm. In 1993 he co-founded Empower America, which in 2004 became FreedomWorks. After he disassociated himself from FreedomWorks in 2005, it sponsored many of the "Tea Party" events and promoted disruptions of health care town hall meetings in 2009. In early 2009, it was announced that Kemp was battling an unspecified cancer, and in May he died at his home in Bethesda, Maryland.